Depending on which State you are resident in there are several sporting activities you and your Basenji can participate in, Lure Coursing, Agility and Tracking are popular amongst Basenji owners. The Basenji loves to chase, to do what comes naturally to him being a hunting dog! It is a natural instinct to run at high speed chasing an object without a collar and lead to hinder his movement. Lure coursing is usually done in a safe and secure area that is fully fenced so even the most disobedient Basenji can still participate. The course is simply made of a lure – a plastic bag – attached to a line that is driven by a motor and changes direction along the way to challenge the dog to turn this way and that at full speed. 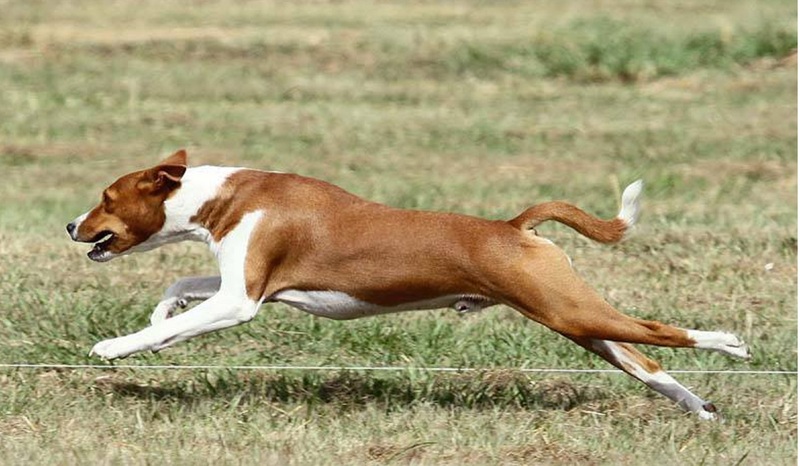 Lure coursing is a great way to release all the pent up energy from your Basenji, providing mental stimulation and exercise at the same time, they love it! A more challenging Sport for the Basenji as it requires them to listen to their handler and obey commands, not a strong point of many of our Basenjis! It is fast, exciting and can be fun if your Basenji is willing to work with you. Food rewards work well in getting your Basenji to pay attention to your commands. 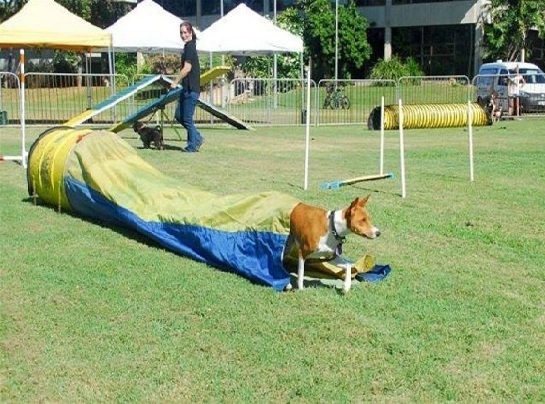 You may want to start your agility training on lead to help control and direct your Basenji. Basic obedience is required before starting this activity. 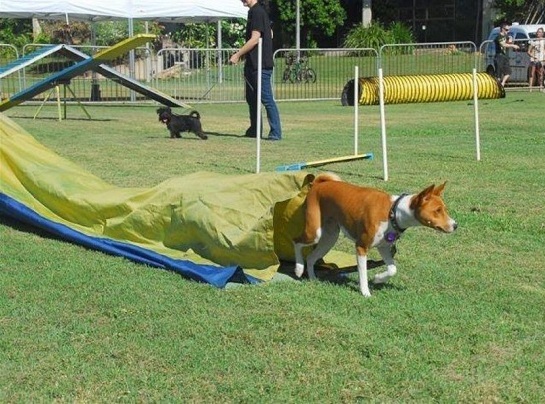 Agility can be done at a competitive/advanced level, where the dogs compete against each other off lead and race the clock, or just for fun allowing your Basenji to burn off excess energy in a mentally stimulating way. Obstacles may include various types of jumps, ramps, elevated walks, weaving poles, tunnels and a see-saw. 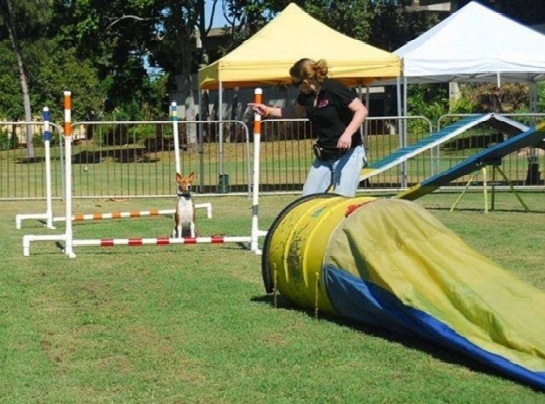 Most Agility Clubs will require your dog to be at least 1 year of age before serious agility training can begin to allow your dog to become fully grown and joints properly developed. 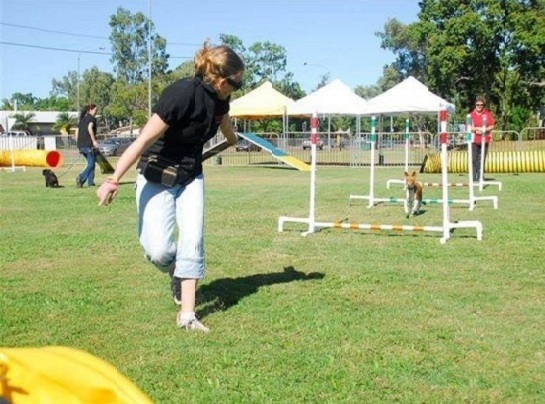 The pictures following show a BBNA member Alysha Cuddy and her Basenji Hope doing an agility course. You may have to search a little harder to find a Tracking club in your area but it is worth looking as the Basenji is dual purpose, being both a sight and scent hound. Tracking is harnessing the dog’s ability to follow a specific scent trail. Tracking is a sport for the cooler months and so you will experience all kinds of weather conditions depending on the State you live in. The dogs must follow a scent trail laid by a tracklayer, and along the way seek out objects [scent articles] dropped by the tracklayer. The time delay from when the tracklayer starts to when the dog starts can be from 20 minutes for test 1 to 3 hours plus for advanced testing. Grass is the primary surface for beginners moving on to pavement and sealed roads for more advanced dogs. Tracking is a great way to challenge your Basenji and builds a strong working bond between the two of you.